In the position below, do you know what White wants to do? White just wants to escape, but what should Red’s game plan be? Whenever you have trapped an enemy checker but still have contact with his other men, you have to choose between trying to capture a second prisoner, or just hanging on to the one you have. 1. Who is threatening whom? If you keep contact, can a riot break out in which the prisoner escapes? 2. Can your opponent break contact easily, meaning that you might as well have broken it yourself and put your men to better use? 3. How do gammon threats affect the decision? 4. Do you have cube access? If so, what game plan will allow you you the most effective use of it? 5. Is your board so porous that he’s likely to get away soon? If so, you probably need a second checker just so his running with one won’t be decisive. Committing to Containment is best here, since White won’t have any trouble getting rid of the last point of contact in his outer board. The only roll that forces a shot is 6-1, and all his non-ace, non-five rolls let him clear the point safely. You might as well put those checkers to use where the action is, trying to prevent Junior from escaping into a winning race for White. Your access to the doubling cube makes the case for this play even stronger. If he doesn’t roll that 5, you have a monster double, and White should pass. Your threat to prime him in is simply too great. If you can do that, then you will either win easily (barring a major dice-barf) or maybe even try for a gammon by hitting him loose and recirculating checkers in an effort to scoop up any unfortunate blots that may lying about. 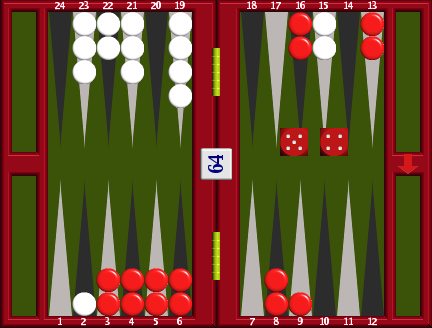 In the actual game, Red played 13/8, 13/9, which was wrong by .289 according to the rollout shown below. The similar-themed 13/8, 9/5 was wrong by about the same equity difference. The cubeful difference in the plays becomes apparent if White doesn’t roll a 5 or a 6-1. As we noted above, then Red can double White out after the correct play, but White has an easy take after this actual play. Red can still double, but the cube doesn’t work as effectively for him since unless he draws an incorrect pass (unlikely here) then he must still win the game on the field instead of by his opponent’s concession. Red was probably was thinking about possibly getting a second checker or at least causing White some grief with his aces, but that wasn’t his best game plan here. However, he was rewarded when White rolled a 6-1, exposing a second blot. Red immediately doubled, and White took. Was his take correct? A mini-rollout shows it to be a pass, but not a huge one. If White felt Red was likely to continue to misplay as badly as he just did, his take, though wrong in the general case, was probably defensible given the specifics.